This robot warrior has a rescue axe for tough rescues, and he and his human ally are sized just right for little hands. 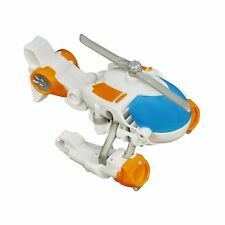 Transformers Rescue Bots Helicopter. Toy is used but still in nice condition. Toy has some playwear with no broken parts. Less common collectibles from the Rescue Bots series. We add new products every week. Then he can race his Chase the Police-Bot car to the scene of the accident! We add new products every week. Missing autobot car. In good working condition. 2015 HASBRO - PLAYSKOOL HEROES. & GRAHAM BURNS. I DO THE BEST ON INFORMING ABOUT ANY PRODUCT SPECIFICATIONS AND PRODUCT'S CONDITION. Playskool Heroes Transformers Rescue Bots BLURR RACECAR 5" Action Figure. Condition is Used has been played with. Does have some paint and play wear. Shipped with USPS First Class Package. (Hasbro Toys. Little heroes can imagine joining Bumblebee on daring rescue missions! Subject to availability). Playskool Heroes Transformers Rescue Bots BLURR 12" Figure NIB Condition is New. Shipped with USPS Priority Mail. The item(s) in the picture is the item you will receive. (Little heroes can imagine joining Bumblebee on daring rescue missions! Subject to availability). Build your own Rescue Squad. We at Bright Pennies work hard to find products you desire and to make those products available to you at a good value. We strive to balance our core two principles. Sized right for little hands. Ages 3 to 7. Then he can roll his Boulder the Construction-Bot dump truck to the rescue! Item Weight: 4.2 ounces. Item model number: A9001000. This robot warrior has a rescue saw for tough rescues, and he and his human ally are sized just right for little hands. Need your item fast?. Make sure this fits. by entering your model number. With so many paths to go down and stories to create, the possibilities for little hands and big imaginations are almost endless! Little heroes can create big adventures in their favorite worlds. Toys are easy for little hands to manipulate and play with. Little heroes can create big adventures in their favorite worlds. Toys are easy for little hands to manipulate and play with. This robot warrior has a rescue saw for tough rescues, and he and his human ally are sized just right for little hands. We cannot make any change. With so many paths to go down and stories to create, the possibilities for little hands and big imaginations are almost endless! Color: Basic pask. Little heroes can create big adventures in their favorite worlds. Little heroes can imagine joining Bumblebee on daring rescue missions!